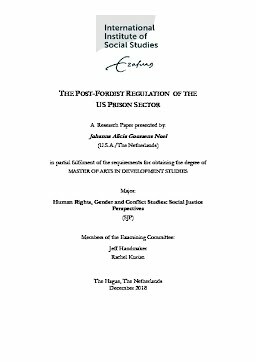 This paper seeks to answer a two-fold question; what were the economic and socio-political conditions that gave rise to a penal system which uses prison labour in the way we see today? And what, if any, role does the penal system play within these larger systemic issues? The prisoner strikes in the Fall of 2018 that specifically focused on prison labour sparked this reflection on the historical formation of the prison system from the late 1970s to the mid-1990s. In order to help me answer this question I am using Régulation Theory (RT) which has provided a methodology to investigate economic dimensions in relation to social and political institutions. RT has allowed me to reach some interesting conclusions that refocuses the debate about the use of prison labour we see today. The current manifestation of the prison system and the use of prison labour therein has typically been attributed to the re-privatization of prison labour through the Prison Industry Enhancement Program legislated by Congress in 1979. While this is definitely a major point of departure which can be traced with the rise of neoliberalism, the economic and socio-political conditions that gave rise to the current penal system cannot be isolated to privatization. In conjunction, this means that the de-bate about neoliberalism, and the role that prison labour plays within it, also extends beyond these boundaries. By outlining the historical institutional moment before the economic crisis of the 1970s and how the response to the crisis led to the emergence of new institutional compromises, I am able to propose in this research paper that the rise of neoliberalism within the US prison sector was championed by the emerging work-first welfare strategies laid out by the state. This operated in tandem with international liberalization and the effects of the Volcker Shock at the beginning of the 1980s, which feed into the system that exacerbated economic inequality particularly by subjugating African American labour.